LaZagne uses an internal Windows API called CryptUnprotectData to decrypt user passwords. This API should be called on the victim user session, otherwise, it does not work. If the computer has not been started (when the analysis is realized on an offline mounted disk), or if we do not want to drop a binary on the remote host, no passwords can be retrieved. LaZagneForensic has been created to avoid this problem. This work has been mainly inspired by the awesome work done by Jean-Michel Picod for DPAPICK and Francesco Picasso for Windows DPAPI laboratory. Folder dump created successfully ! Note: Use -v for verbose mode and -vv for debug mode. 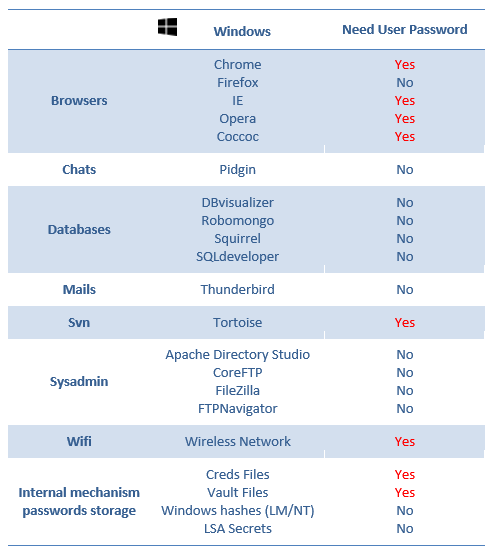 Note: Check the following image to understand which passwords you could decrypt without needed the user windows password. All credentials found will be tested as Windows password in case of the user re-uses the same password.